Ride the Byte was developed to make the normally invisible structure of the internet transparent for the general public and allow people to see the path taken by data packages transmitted via the internet. 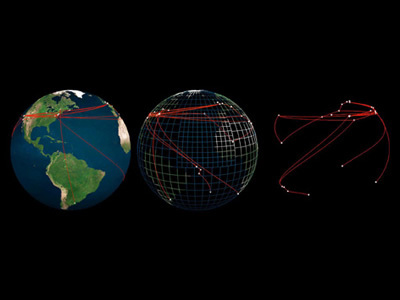 This electronic representation also visualises the flow of information to selected websites in the form of a simulated journey across a virtual reality globe. The journey begins at the actual site of the installation with a website being called up. This triggers the dispatch of data packages to the geographic destination of the selected website and the relevant server. 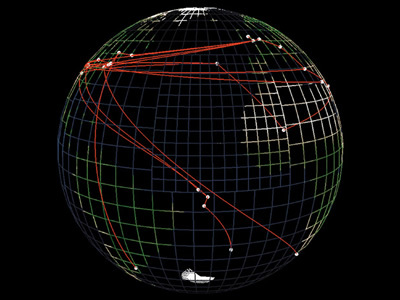 The ever-changing route of the data packages is charted visually on the surface of the virtual reality globe.